The Pokémon raises the foe’s PP usage. Raises evasion in a hailstorm. Articuno does not evolve/is not evolved into. X A legendary bird Pokémon. It can create blizzards by freezing moisture in the air. X Ein Legendäres Vogel-Pokémon. Es kann Blizzards verursachen, indem es Feuchtigkeit gefriert. X Un Pokémon Oiseau légendaire. Il peut provoquer des blizzards en gelant l’humidité de l’air. X Legendario Pokémon pájaro capaz de generar ventiscas congelando la humedad del aire. X Un Pokémon uccello leggendario. Riesce a creare bufere di neve congelando l’umidità dell’aria. X 전설의 새포켓몬이다. 공기 중의 수분을 얼려 눈보라를 만들어 낼 수 있다. Y A legendary bird Pokémon that is said to appear to doomed people who are lost in icy mountains. Y Ein Legendäres Vogel-Pokémon, das angeblich in Gletschern verirrten Wanderern den Weg weist. Y Le légendaire oiseau des glaces. On dit qu’il apparaît aux gens perdus dans les sommets. Y Es un legendario pájaro Pokémon. Se aparece a la gente que se ha perdido en las heladas montañas. Y Uccello leggendario, si dice appaia per atterrire chi si smarrisce sui ghiacciai. Y 설산에서 추워 죽을 것 같을 때 눈앞에 나타난다고 하는 전설의 냉동포켓몬. Omega Ruby Articuno is a legendary bird Pokémon that can control ice. The flapping of its wings chills the air. As a result, it is said that when this Pokémon flies, snow will fall. Omega Ruby Arktos ist ein sagenumwobenes Vogel-Pokémon, das Eis manipulieren kann. Das Schlagen seiner Flügel bringt die Luft zum Gefrieren. Man nimmt an, dass es zu schneien beginnt, wenn dieses Pokémon fliegt. Omega Ruby Artikodin est un Pokémon Oiseau légendaire qui peut contrôler la glace. Le battement de ses ailes gèle l’air tout autour de lui. C’est pourquoi on dit que lorsque ce Pokémon vole, il va neiger. Omega Ruby Articuno es un Pokémon pájaro legendario que puede controlar el hielo. El batir de sus alas congela el aire. Dicen que consigue hacer que nieve cuando vuela. Omega Ruby Articuno è un Pokémon uccello leggendario, perfettamente a suo agio tra i ghiacci. Quando batte le ali, l’aria circostante diventa gelida. Per questo motivo, quando nevica, si dice che sia passato di lì. Omega Ruby 얼음을 조종하는 전설의 새포켓몬이다. 날갯짓하면 공기가 차갑게 식기 때문에 프리져가 날면 눈이 온다고 전해진다. Alpha Sapphire Articuno is a legendary bird Pokémon that can control ice. The flapping of its wings chills the air. As a result, it is said that when this Pokémon flies, snow will fall. Alpha Sapphire Arktos ist ein sagenumwobenes Vogel-Pokémon, das Eis manipulieren kann. Das Schlagen seiner Flügel bringt die Luft zum Gefrieren. Es wird behauptet, dass es zu schneien beginnt, wenn dieses Pokémon fliegt. Alpha Sapphire Artikodin est un Pokémon Oiseau légendaire qui peut contrôler la glace. Le battement de ses ailes gèle l’air tout autour de lui. C’est pourquoi on dit que lorsque ce Pokémon vole, il va neiger. Alpha Sapphire Articuno es un Pokémon pájaro legendario que puede controlar el hielo. El batir de sus alas congela el aire. Dicen que consigue hacer que nieve cuando vuela. Alpha Sapphire Articuno è un Pokémon uccello leggendario, perfettamente a suo agio tra i ghiacci. Quando batte le ali, l’aria circostante diventa gelida. Per questo motivo, quando nevica, si dice che sia passato di lì. Alpha Sapphire 얼음을 조종하는 전설의 새포켓몬이다. 날갯짓하면 공기가 차갑게 식기 때문에 프리져가 날면 눈이 온다고 전해진다. Red A legendary bird Pokemon that is said to appear to doomed people who are lost in icy mountains. 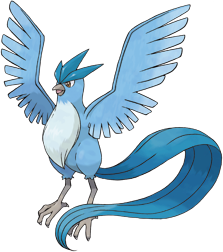 Blue A legendary bird Pokemon that is said to appear to doomed people who are lost in icy mountains. Yellow A legendary bird Pokemon. It freezes water that is contained in winter air and makes it snow. 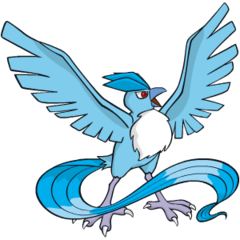 Stadium A legendary bird Pokémon with long and distinctive tail feathers. Said to appear if you are freezing on a snowy mountain. Gold The magnificent, seemingly translucent wings of this legendary bird Pokemon are said to be made of ice. Silver One of the legendary bird Pokemon, it chills moisture in the atmosphere to create snow while flying. Stadium2 The magnificent, seemingly translucent wings of this legendary bird Pokémon are said to be made of ice. Ruby Articuno is a legendary bird Pokemon that can control ice. The flapping of its wings chills the air. As a result, it is said that when this Pokemon flies, snow will fall. Sapphire ARTICUNO is a legendary bird POKeMON that can control ice. The flapping of its wings chills the air. As a result, it is said that when this POKeMON flies, snow will fall. FireRed One of the legendary bird POKeMON. With its long tail trailing behind, its flying form is magnificent. LeafGreen A legendary bird POKeMON that is said to appear to doomed people who are lost in icy mountains. Emerald ARTICUNO is a legendary bird POKeMON that can control ice. The flapping of its wings chills the air. As a result, it is said that when this POKeMON flies, snow will fall. Diamond A legendary bird Pokémon. It can create blizzards by freezing moisture in the air. Pearl A legendary bird Pokémon. It can create blizzards by freezing moisture in the air. Platinum A legendary bird Pokemon. It can create blizzards by freezing moisture in the air. HeartGold The magnificent, seemingly translucent wings of this legendary bird Pokémon are said to be made of ice. SoulSilver One of the legendary bird Pokémon, it chills moisture in the atmosphere to create snow while flying. Black A legendary bird Pokémon. It can create blizzards by freezing moisture in the air. White A legendary bird Pokémon. It can create blizzards by freezing moisture in the air. Black 2 A legendary bird Pokémon. It can create blizzards by freezing moisture in the air. White 2 A legendary bird Pokémon. It can create blizzards by freezing moisture in the air.